Marc Trestman and Jim Popp have added a familiar face to the Toronto Argonauts coaching staff. The team announced Monday that they have hired legendary Montreal Alouettes QB Anthony Calvillo to be their new quarterbacks coach for 2018. 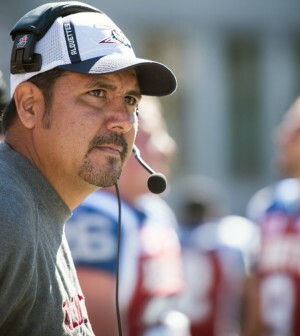 Calvillo, who officially retired in 2013 after 20 seasons in the CFL, set all-time CFL records for pass yards (79,816), touchdown passes (455), pass attempts (9437), and pass completions (5892) during his career. He was also a 3-time Grey Cup Champion (2002, 2009, 2010), won three CFL Most Outstanding Player Awards (2003, 2008, 2009), and been named to four CFL All-Star teams (2002, 2003, 2008, 2009). The 45-year old spent the previous three seasons as a member of the Montreal Aloutettes coaching staff, serving time as the receivers coach, quarterback coach, and offensive coordinator in that span.